Never Enough Nails: Born Pretty Store Holos! 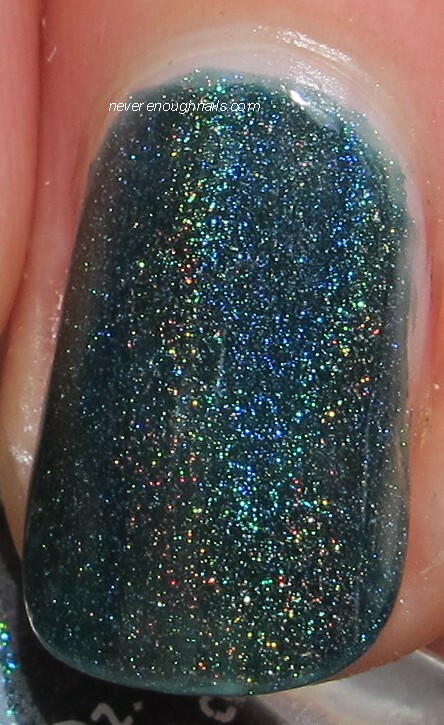 The Born Pretty Store holo polishes in this post were sent for review. All opinions are my own honest thoughts. Today I have two of Born Pretty Store's holo polishes for your viewing pleasure! While Born Pretty Store is my go to place for nail art supplies, I sometimes forget they have polish too. When I saw they have holo polishes now, I had to try some of them! The first one I tried was the beautiful dark blue-tinged green #12. I've been wanting a darker green holo since Glitter Gal came out with Lizard Belly. I keep putting off buying Lizard Belly for some reason, but I think this polish helps fill that void. The picture above shows #12 in the shade. This is also what it looks like most of the time you are indoors. #12 was pretty easy to work with! I didn't experience any bald patches like some holos have, but I don't usually use a base coat with holos. I think they often apply better with no base. #12 was opaque in two coats, but there were a few small streaks that I wanted to smooth out, so I did a third coat. Next up is #1, a sheer silver holo top coat. You can see above, I tried it on it's on (that's two coats) and it will never be opaque alone. So it is definitely best used as a top coat. Ahhhh, #1 looks much better as a holo topcoat over a dark blue-purple shimmer! #1 isn't as holo as #12, but it still will look really pretty over other colors to add a bit of rainbow to your day. I only needed 1 coat of #1 over the purple for this look. It was really easy to apply over another color and looked pretty even. I can see a streak or two here and there, but nothing too offensive. 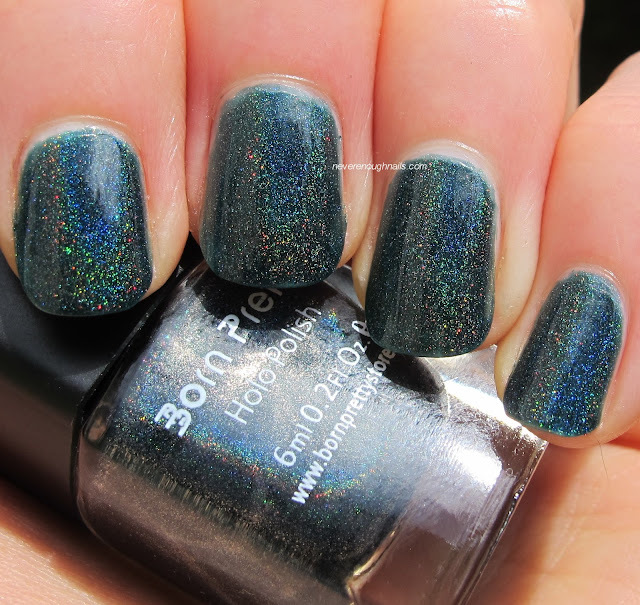 Now, the Born Pretty Holos are mini bottles and they are $12.88 when they are full price. Fortunately, they go on sale a lot. They are currently $5.59, with free shipping and you can use coupon code ERJ61 for another 10% off. 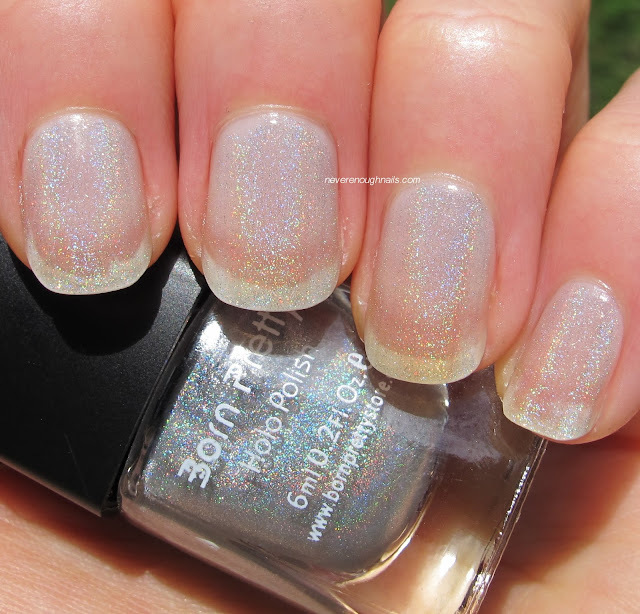 I definitely think #12 is worth that price, and if you are looking for a holo topcoat, #1 may be what you're looking for. Check out all of the colors they have available here.